Looking for a pair of vegan wedge boots? You're in the right place! We've put together a list of all of the best-looking, animal-product free, and functional wedge boots we could find. Chic women's ankle bootie with a toffee microfiber upper and a beige rubber wedge sole with white accent stitching around the top. Zips with a fashionable antique gunmetal zipper on the outer side of the boot. Features diagonal stitching detail across the toe. A Tom's logo is embroidered on the heel in beige thread that blends in with the microfiber. Supports the foot with a cushioned footbed. Advertised as vegan: Yes, in the description: "vegan-friendly construction." Pros: Tom's shoes are known to be comfortable, functional and slick-looking. You can wear these elegantly designed boots with a dress out to dinner or with jeans for a stroll. Cons: They're so adaptable that it would be great if they had some water resistance, too, but there's no indication either way. Super fresh men's black faux leather boot in a high top style that covers the ankle. Laces up with a lack bootlace and brassy eyelets. Has a cool moc toe and white contrast stitching. Cream wedge sole is treaded for good traction. Comfortable design with a cushioned insole and padded collar and tongue. Advertised as vegan: No, but the boots are made of synthetic Permahide leather. Pros: Excellent casual footwear that'll help you look effortlessly put together whether you're wearing jeans or canvas pants. In fact, they'd look great with pretty much any pants you want to pair with them. Wearable to work, around the city or in the countryside. Cons: Just a tad pricey. The faux leather should have some water resistance, but we can't be totally sure. Ladies' gray fall or winter wedge boot with a mottled gray knit leg you can wear up or fold down. Has a matching gray heel 2.5" in height. Tightens at the top of the foot with a silver buckle strap. Foot is made of water-resistant polyurethane. Advertised as vegan: No, but these boots are man-made. Pros: Cute, cozy wedges for cold or damp days. We love that the roll-up-or-down leg lets you adjust the look and warmth. Cons: Probably OK on varied surfaces but not suited to seriously snowy or heavy weather conditions. They're also fairly expensive. 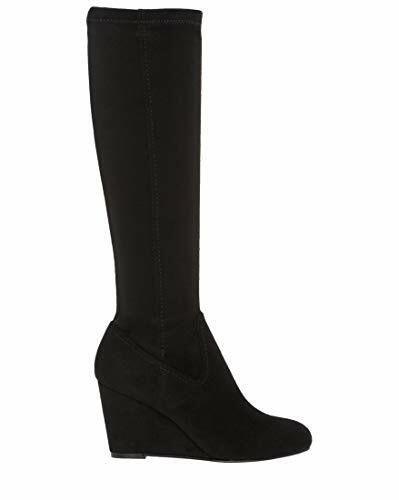 Simple yet sophisticated women's black microfiber wedge boot. Toe is a graceful almond shape. 15" tall leg zips all the way down on the inner side. Wrapped heel is 3" tall. Advertised as vegan: No. The product description shows all synthetic materials. Pros: Black knee high boots like these are fashion essentials that dress up your spring and fall wardrobes. These are pretty decently priced and should feel nice because of the soft, stretchy legs. They're totally made for shorter dresses and trendy animal prints. Cons: We're not sure if these boots have any padding inside. 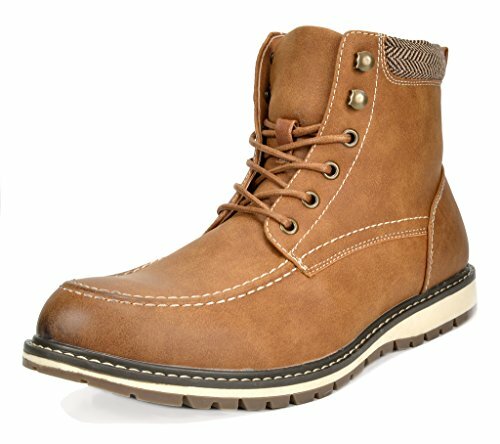 Men's dapper brown faux leather work boot with a herringbone collar and wedge sole. Tons of style with a moc toe and white stitching. Zips on the inner side and laces up with brass hardware in the front for a snug, adjustable fit. Faux fur lining and padded footbed keep your foot comfy and warm. Treaded sole is made of durable, skid-resistant rubber. Advertised as vegan: No, but the boots are all synthetic. Pros: Warm, comfortable and beautiful boots fit for motorcycle riding, work or leisure. A great buy for the price. You can wear these with jeans, but you can also play up the herringbone detail with mixed textiles and patterns. Cons: Not waterproofed — don't plan on wearing these in wet weather or snowy conditions. Ladies' brown faux leather hiker-style boot with a soft, chenille-like knit cuff in complementary cinnamon brown. Laces up with a light brown bootlace. Has a cushioned insole to protect your foot. Black platform sole is textured on the bottom for decent traction. Low heel is 1.5" high. Advertised as vegan: No, but the materials are man-made. Pros: Hiking-type boots are making a splash in the fashion world, so these would keep you stylish paired with leggings, a long cardigan and a layered scarf. Definitely suited to autumn and spring weather. Cons: A bit narrow in the toes. These are probably not rugged hiking boots so much as gentle activity or fashion boots. Women's laid-back, allover denim ankle wedge with a hint of sass. Has front lacing with a waxed blue shoelace. Lined and padded inside for comfort. 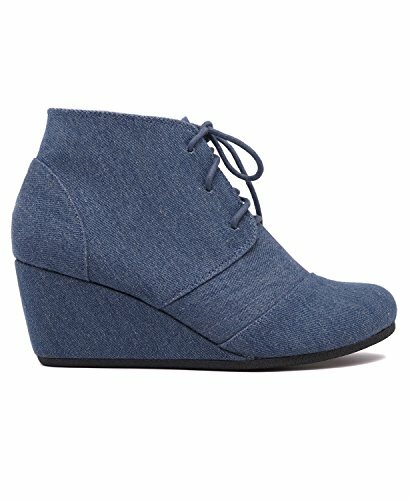 Low, denim-wrapped heel is 2.25" tall. Pros: Lace-up boots are timeless, but sometimes they need a little jazzing up. These are inexpensive, casual/cool boots for warm (or cool) days that you'll want to wear with soft knits and dangly statement jewelry. Cons: Some reviewers have loved these boots but found that they don't last a long time. White faux leather ladies' combat boot with faux shearling lining and a low wedge heel. Lacing and rubber lug sole are black for elegant contrast. Pull tab on the back of the boot makes it easier to get it on. Tons of thick cushioning to ensure all-day walkability. Advertised as vegan: No, but these boots are faux leather and faux shearling. Pros: Toasty winter boots if you don't need all the bulk of heavy winter footwear. The combat style is all the rage and wearable with anything from a plaid dress to casual pants. Cons: We don't see anything about waterproofing, though they might have some water resistance. Just in case, it might be a good idea to waterproof them if you want them to hold up in the snow.